CABLE HIGHLIGHTS: FX’s AMERICAN HORROR STORY had a heavy Week 2 drop, as is usual for that franchise, down 0.38 to 1.07. 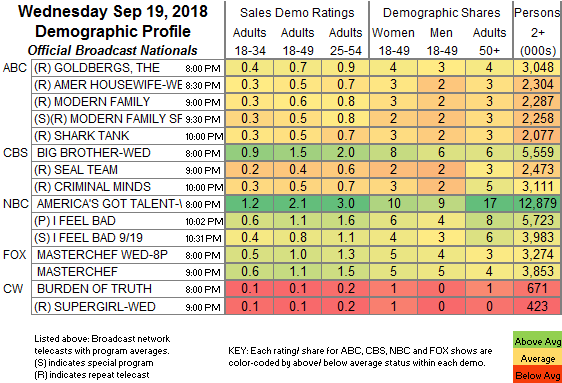 VH1 aired 3 hours of BLACK INK CREW at 0.69/0.58/0.58, compared to last week’s 0.49 hour, with a late-night lead-out of SAFEWORD at 0.31. ESPN’s MLB MONDAY NIGHT games were at 0.30/0.27. On History, FORGED IN FIRE lost 0.03 to 0.35. MSNBC’s RACHEL MADDOW SHOW led cable news at 0.35/0.53/3.1M, with Fox News’s TUCKER CARLSON TONIGHT at 0.34/0.55/3.3M, and CNN’s CUOMO PRIME TIME at 0.21/0.32/1.1M. OWN’s GREENLEAF dropped 0.04 to 0.30. On HGTV, HOUSE HUNTERS ticked down to 0.28, PROPERTY BROTHERS fell 0.09 to 0.29, and HOUSE HUNTERS INTL ticked up to 0.27. 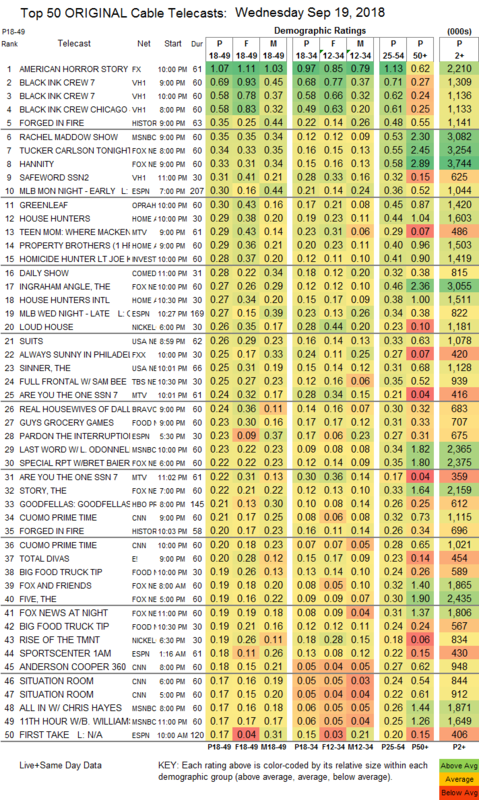 On MTV, TEEN MOM was up a tick to 0.29, and ARE YOU THE ONE was as 0.24/0.22, compared to last week’s 0.26. On ID, HOMICIDE HUNTER dropped a tick to 0.28. Nickelodeon’s 6PM LOUD HOUSE was at 0.26. On USA, the midseason finale of SUITS ticked up from last week to 0.26, which was down a big 0.21 from the midseason 2017 closer, and the season finale of THE SINNER was up a tick from last week to 0.25, which was down a whopping 0.52 from 2017. FXX’s IT’S ALWAYS SUNNY IN PHILADELPHIA rose 0.05 to 0.25. TBS’s FULL FRONTAL dropped 0.08 to 0.25. Bravo’s REAL HOUSEWIVES OF DALLAS lost 0.04 to 0.24. On Food Network, GUY’S GROCERY GAMES shed 0.04 to 0.23, and BIG FOOD TRUCK TRIP premiered at 0.19/0.19. The season premiere of E!’s TOTAL DIVAS was at 0.20. El Rey’s LUCHA UNDERGROUND was steady at 0.02/97K.